Lifting the Bonnet, The McCarthy Blood in the Shouldhams of Coolkelure, Dunmanway and Lord Carbery of Castlefreke, other West Cork landlord Families lineage. To let 1766 lands during minority of Master Shouldham, aged 7 years Dunmanway, 800-900 acres at Gleanarough apply Dr. Creagh or James Galwey at Tullyglass near Enniskeane. The Shouldhams of Coolcelure, Dunmanway descend from the 1737 century marriage of Shouldham of Kerry and Miss Anaste McCarthy the heiress of the remaining McCarthy Estates in Dunmanway. She probably conformed to the Church of Ireland as a Shouldham appears in the Convert Rolls. 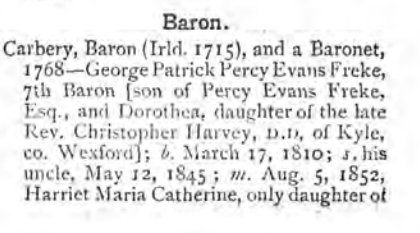 One of their descendants marries Lord Carbery as set out in Guy’s Directory for Co. Cork of 1875-6. Ironically the McCarthys as well as the O’Mahony and O’Donovan families migrated from Co. Limerick to West Cork in the early 13th century, having being displaced by the Normans. Current DNA evidence would suggest that an elite group migrated and the local West Cork people adopted their surnames which might explain the numerous septs of the various families in the area. Other West Cork families such as the Townsends have a similar background. The main line of the family originated from the early 18th century marriage of Colonel Townsend and Miss Galwey, she again appears in the Convert Rolls. If female descent was given the prominence it deserves the family might be know as the Galweys. Looking at the Cork Magistrates from 166o to 1922 on the surface they appear as a monolith, predominantly with English names and largely Protestant. However, in the Church of Ireland, it was common for children to be given their mother’s maiden name or even their grand mother’s surname as Christian names. Looking at legal documents and listings of Magistrates where the full name is given, it is surprising at the patterns which emerge. It is necessary to leave religion aside and concentrate on the full name. Then behind the headline name the old Cork names appear, Hiberno Danish/Norse: Cotter, Coppinger, possibly Galwey and Meade. Gaelic: Roynane, McCarthy, Terry, Morrough, Coughlan, O’Donovan, O’Hea, Cronin. Norman: Barry, Roche, Hodnett, Fitzgerald, Lavellan, Uniacke. In a sense the incomers grafted onto a rootstock of the upper echelons of the local population and in time became assimilated.